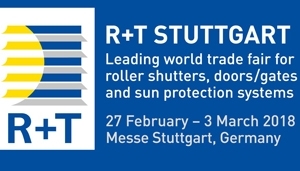 From 27 February to 3 March 2018 Goelst will be present at R + T Stuttgart. Come and discover the possibilities of Goelst curtain rails at the trade fair for roller shutters, roller shutters and sun protection systems. Be surprised by Goelst at stand 7D41! For free access to the fair you can send an e-mail to info@goelst.com and please state how many free tickets you wish to receive. Of course you can also contact us for more information or a personal appointment. We look forward to meeting you!